Young Americans for Freedom fight to save our republic! 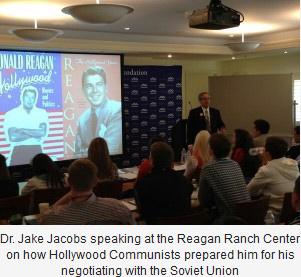 On Friday, March 22 at the Reagan Ranch Center in Santa Barbara, California, I was blessed to speak on The Life & Character of Ronald Reagan to 70 High School "Young Americans for Freedom" from all over the United States. Many of them came up afterward to thank me for what they said was an inspiring speech. They don't realize how much THEY inspire me and give me courage to continue in the Battle for the preservation of our Constitutional Republic that at times seems a lost cause. Since 2009 I have been traveling Wisconsin and America speaking at many Constitutional, Conservative, Libertarian, Tea Party and Republican events. The overwhelming majority of the participants at these events have been "gray hair" Patriots who are profoundly concerned that we are losing our Republic and the Liberties we so cherish. I admire their dedication to fight the fight because they are right. We are dying as BIG Government Statists like Obama, Progressives, Socialists and Cultural Marxists permeate our culture and have taken over the major institutions in our Land. We are at WAR! Not a War with artillery, tanks, planes, and bombs but a WAR of Culture and Ideas. Unfortunately The LEFT is Winning their War to destroy our Republic under God as they have not only taken over our government schools but they have duped and or convinced millions of Americans that it is perfectly normal and natural to demand Entitlements from the hard working citizens and producers in the United States. However, with ALL the negative News of explosive National DEBT and a President who lives in Denial about it, I was encouraged to see many fine young Americans who love freedom, admire President Ronald Reagan and who want to see his ideas and our Founding Fathers ideas back in our Nation again. I told those Young American Patriots in Santa Barbara that God Blessed my life by allowing me to be one of the last Americans to meet President Reagan in 1998 in his L.A. office. Many of my teaching colleagues ridiculed my devotion to the "Great Communicator" as I was attacked by them and in local newspapers as a fool who should be fired as a teacher of American History. That's OK. My hits were nothing compared to Reagan's. My unabashed admiration for President Reagan was based on his unabashed commitment to the values that made America great! 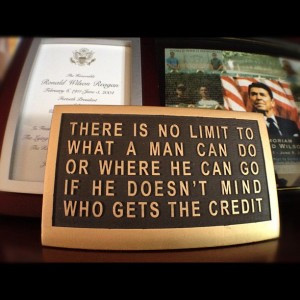 Ronald Reagan was an authentic Patriot who truly believed in the values of our Founding Fathers. Values such as family, peace through strength, lower taxes and most importantly a limited Constitutional republican form of government under God. President Reagan called the atheistic Soviet Union an Evil Empire because he knew it was a Socialist Empire as murderous and tyrannical as Nazism or National Socialism. Reagan in the face of typical naive and foolish appeasing Left Wing criticism challenged the status quo of containment and detente and resolutely looked Evil in the eye and did not blink. Reagan's brilliant statesmanship was instrumentally responsible for bringing the Evil Empire to an end and for tearing down Europe's Evil Iron Curtain of oppression. He had a simple philosophy when it came to the USSR: "We WIN, they lose." 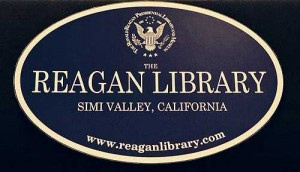 To this day many from Eastern Europe pay homage to President Reagan by visiting his grave in Simi Valley, California at the Reagan Library. I know I've been there a number of times and have meet them personally. They applauded him wildly! Reagan's simple but brilliant understanding of basic economic principles also tore down the wall of economic oppression ending the 70�Œs recession and malaise by much needed tax cuts that opened doors of explosive productivity, entrepreneurial expansion, and capital investment whose effect and efficacy gave America our longest economic growth in modern history. While the intellectual elite of Europe and America called him a simpleton, Americans didn't need a Ph.D. to see that Reagan "got it." While he was profoundly well read and could quote the great philosophers and economists of Western Civilization he never flaunted his intellectual acumen even in the midst of harsh ad hominem attacks by the gurus of the universities and elite media who thought they knew so much that wasn't so. He was right, they were wrong. Dead wrong! And they still are. Dr. Jake Jacobs has been married for 32 years to his lovely wife Lori and has two children Joseph 28 and Anastasia 25. When he's not writing, teaching or speaking he loves watching the Green Bay Packers and enjoys his fire-pit at night, watching the Heavens declare God's Glory. He is president and founder of POLITICALLY INCORRECT INSTITUTION, and is the Host of Freedom Project Academy's ONE NATION. Jake has degrees in American History and Biblical and Judeo-Christian Studies from Arizona State University, Ashland Theological Seminary and North-West University. 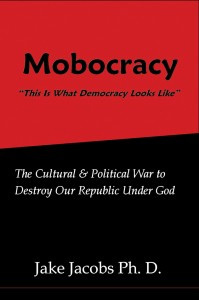 Dr. Jacobs has spent more than 30 years at the public and private high school system, and at the college level teaching his passion for our Constitutional Republic under God, all the while stressing historical correctness, in the face of politically correct intimidation by the academic establishment. 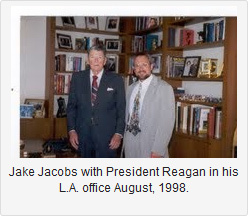 When Dr. Jacobs was a public High School teacher he publicly defended Wisconsin Governor Scott Walker on Fox & Friends. Jake is a frequently requested speaker for, Young American's for Freedom, a regular guest on Conservative Radio and very popular at Tea Party, civic and church events. He is a dynamic and energized speaker, writer, and historian who will not only get your audience's attention, but move them to action! Kavanaugh hearing is Democrat warfare!